Remember that beautiful species orchid that flowered so well for you last year? Can you remember when it flowered? If you’re like me, you’ll be able to recall the species well but not its time of flowering, unless it coincided with a major show. Therefore, a year or two ago, I decided to make a note of each of my species as it flowered, together with the month of flowering. I don’t intend to list them all, just those species that I find relatively easy to grow and flower. Most of those listed were grown in one of my ‘cosy’ shade-houses for the whole year but a few that need a heated glasshouse during winter are included and have been marked with an asterisk in each of the following six articles. Most of the orchids are mentioned and described only once, although in some cases they flower several times each year. For example, one or another of my various plants of Masdevallia veitchiana was in bloom for no less than ten months of the year – any longer would be boring! The flowering period also depends on the conditions under which the orchids are grown – those kept in a heated glasshouse usually flower a month or two before those grown in a shade-house. 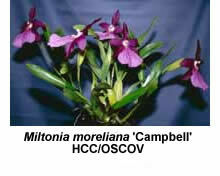 January to March is regarded as the low season in an orchid grower’s calendar. However, a selection from the following list should ensure that you have a few orchids in flower during that period. Only those who have orchids in flower on every day of the year can truly claim to be accomplished orchid growers! Bulbophyllum lobbii* is a warm-growing, Asian species that must be grown in a glasshouse maintained at a minimum temperature of 12°C throughout the year; a minimum of 15°C will give even better results. In contrast to the relatively short-lived flowers of many bulbophyllums, the large yellow flowers (up to 75 mm across) of B. lobbii usually last in good condition for at least a month. In my experience, plants do better when mounted on bark or tree fern than they do when grown in pots. 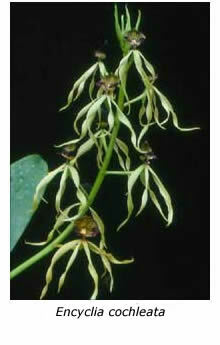 Encyclia cochleata* (syn. Prosthechea cochleata) was one of the first epiphytic orchids to be introduced into cultivation, having been grown at Kew Gardens for over 200 years. 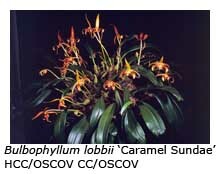 Then known as Epidendrum cochleatum, it was given the common name Cockleshell Orchid, because its labellum resembles the inside of a cockleshell. This species flowers sequentially, only four or five flowers being open together at any one time. As more buds begin to open, so the lowermost flowers wither and fall. The erect inflorescence may continue to produce more buds and flowers for up to a year. 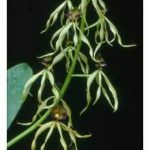 In contrast to those of most orchids, the flowers are non-resupinate, their lips being held uppermost. The lip has yellow, and purplish markings while the pendant petals and sepals are greenish yellow. Encyclia prismatocarpa* (syn. Prosthechea prismatocarpa) is one of my favourite orchids, despite the space that is fairly large plant occupies in my glasshouse. A native of Panama and Costa Rica, I keep it at a minimum temperature of 12°C, although it may grow satisfactorily under cooler conditions. 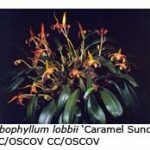 The yellow-green sepals are attractively marked with brown bars, while the labellum has a purplish pink tip. A dozen or more long-lasting flowers are attractively presented on the erect inflorescence produced by each new mature growth. Lycaste aromatica may be grown either in a cosy shade-house or in a heated glasshouse. It flowers in November if grown with heat but not until January in the shade-house. The scented, yellow flowers are produced from the base of the pseudo-bulbs that matured during the previous season. Under ideal conditions of cultivation each pseudo-bulb may produce up to 15 flowers but my plants, grown in the shade-house, seldom yield more than five per bulb. This species should be watered and fertilised frequently while in active growth but water should be withheld during the cooler months of the year. In nature Maxillaria cucullata is found growing in Mexico, Guatemala and Costa Rica at altitudes of 1500-3000 m, and it can therefore tolerate cool conditions of cultivation in Melbourne. 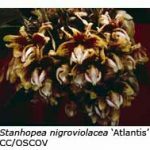 Its yellow flowers have orange markings and a red-brown lip; each pseudo-bulb produces one to three flowers, each a on short stem. This species is found in wet forests, and I have found that it enjoys being suspended in my masdevallia house, where it receives frequent misting during the warmer months. Although a parent of many of the commonly cultivated Brazilian miltonia hybrids, Miltonia spectabilis is seen far less often on the show bench. Its inflorescences emerge between the bracts at the base of the recently matured pseudo-bulbs; each bears one or two flowers with white or cream petals and sepals and a flat, pink lip. It may be grown either in a pot or on a mount. Miltonia spectabilis var. 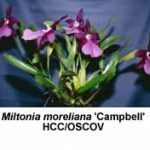 moreliana, in which all the segments are purple, has recently been given individual species status, and is now known as Miltonia moreliana. It flowers several months later than Miltonia spectabilis. Stanhopea nigroviolacea has a special fascination for me. When grown in a hanging basket lined with paperbark, its spear-like inflorescences force their way down through the liner, whereafter the buds gradually expand until they resemble a yellow tennis ball. Then early one morning the buds open to reveal several glossy yellow and purple-red flowers, each fully 150 mm across. Sadly, they last in good condition for only a few days. Although there are about 60 species in the genus, only S. nigroviolacea, S. tigrina and S. wardii seem to grow and flower satisfactorily without warmth in Melbourne. 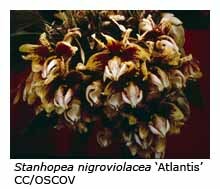 Stenoglottis longifolia, which flowers in autumn, is the most well known species of the terrestrial genus Stenoglottis. However, I prefer the slightly smaller-growing Stenoglottis woodii. When grown in the shade-house, its buds begin to open in January and continue opening throughout February into March. This species perhaps does a little better if grown with warmth, when its buds begin to open in December. My clone has white flowers but others are pale pink. Thunia marshalliana is a deciduous orchid from the Himalayas that enters a long dormant period during winter. The dormant canes should be re-potted in spring, after cutting their old roots back to about 50 mm in length. Any rich terrestrial mix may be used. Begin watering as soon as the new growth appears from the base of the old cane and fertilise heavily, because the new growths must mature by Christmas if they are to bloom. The terminal inflorescence on large plants may produce up to a dozen large white flowers with a fringed lip marked with yellow and orange. Thunia marshalliana needs good light and a warm position in the shade house if it is to flower – as a rule, if the flowers haven’t appeared by mid-January, then they’re unlikely to so until the following season!